We have some great news to report. Our very own Paul Willo let out a huge sigh of relief earlier this week as on the 7th, a massive pallet of CD’s arrived at his place. Yes, the long awaited Specialized Mad Not Cancer album is here! This week we continue our reviews of the 74 cover versions on the 4CD album. For those of you who ordered the album copies should start landing on doormats. If you’ve not yet placed an order we urge you to do it sooner rather than later as more than half of the stock has already been sold. Beyond Specialized news we have reviews of the live Crunch! songs which were aired earlier in the week, and of course, our usual rundown of forthcoming gigs, interesting Tweets from The Twittersphere, and much more. So, sit back, and enjoy. November 14th. The Big One 3. Park Dean, Sandford Dorset. More festival dates to follow. *** New *** November 8th – Hertford Corn Exchange. 39 Fore St. Herts. SG14 1AL With support. The Skammers. November 16th – Confirmed in the Sunday Lineup of bands at Specialized The Big One 3. In Dorset. Lee will be doing a photo signing session too. For details of future gigs keep an eye on http://deafschoolmusic.com for more information. If money’s currently burning a hole in your pocket then perhaps we can help with your dilemma. Over on the Madstore, at http://madness.sandbaghq.com/left-menu-madness/clothing/t-shirts.html/ a selection of new official T-shirts for you to buy, have been unveiled. The most mentionable among the new designs is a summer white palms t-shirt, depicting a tropical sunset beach seen through an outlined Madness crowned M. Very Nice. It has a very Nassau Madness Seven mode we feel. Other New Shirts include a ringer, showing a crowned M with a laurel ring around it, and an orange Madness London Logo on grey. See below for details of the tour T-shirt which can be bought on its on separately. The M.A.D.H.E.A.D Tour T-shirt – Get it now. What does any self respecting Madhead wear? The only true fan clothing of choice right now is surely the brand new Madhead T-shirt. Available now at least five months ahead of the tour, this T-shirt is so NOW! The brand new 2014 picture of all seven of the band next to their happiness machine and ready to bring joy. You can look stylish in it in a range of sizes, you can promote this summer, the forthcoming tour and help your heroes and of course in this day and age by buying the bands official clothing you are putting your money into the future new album project pot etc of the band who exist these days on their own self produced record label. We’re very happy with this move to give out the T-shirt ahead of the tour as it makes so much sense to us. The T-shirt is relevant and current for a longer period of time for the fan. Steer clear of knock off clothing and get the official Madhead T-shirt. Support your favourite band directly, like a true Madhead. Over 70 tracks. 4 CDs. 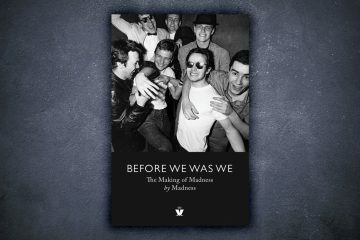 Cover versions of Madness by not just Ska bands but lots of young up and coming acts of many genres including a few famous pop stars and Bedders on one track, too. All for Teenage Cancer. The new compilation album of tunes chosen especially by Suggs. It features one Madness track It must be love, and one solo track – So Tired. Alongside one self produced track The Farm’s – Stepping Stone. The rest of the 60 track 3 CD album contains his own personal music joys. Signed copies are available from record store. My throat is sore. The kind of self-inflicted soreness you get from bellowing lyrics out from the bottom of your stomach and out through your mouth with a force of some passion. But then I’ve waited over 6 years to hear this song “Saint’s and Sinners” sung live again by Lee Thompson, this is the track that’s making an impact shaking loose skin from my vocal chords, as I happily yell along. It’s a powerful rock song, and the keyboard intro’s on the beginning, like that of a church organ, create the most anticipatory alert at the start of the track, soon the rhythm kicks in like a juggernaut, before the singer, the white face painted wonder, leaps into the words like Jesus giving that sermon when he kicks the money lenders temple over all Bruce Lee style. Kix lyrically rips apart the theme of religious nutters, as a few Crunch! songs do, and Spider ripples the fierce rhythm through the band, the fans rip it up on the floor, and my throat gets ripped at the end of the tracks growling and shouting brilliance. Pure joy. On a day of much rejoicing. The fact a tune as good as this remains unreleased, officially in the wilderness, is why I’m glad I’m witnessing the return of any line up that can play Crunch! songs. This songbook contains potential as yet untapped and done justice to on record. The band Nutty Boys Crunch! deserves a second coming of songs like this one, onto an album, it’s a long promised land, would be testament to their greatness, rather than the waste its always been so long over due. Even if it’s a demo’s release only. A wider number of ears need to hear these songs. Praise be to the songs of Crunch! The power and energy with which this song was delivered was fantastic. The comeback of these songs, delighted a packed out venue, the gig had a special feeling, brought to it by the majority of those present. Despite the respectful billing of Lee Thompson band, It was either, depending on who you were, “Wow The return of Crunch!”, “Wow The return of the Nutty Boys (to their 90’s top form)” or an “oh my god I never thought I’d get to see Crunch! live” (kind of) a day. A triple power pack of expectations and wonder that lead to a cheering unity of impressive levels within the small venue. Like Madstock brought back only the best era of Madness into the mind of fans some 22 years ago now, Sunday’s gig blew forgotten damp squibs of 100 club gigs away from the whimpered end of the previous band era, and focused only on the hey happy days of previous glory for some of these nutty boys fans, and for Tadman, Spider, Louis and Thommo especially. It’s not quite the fully Nutty Boys though. It’s only The Nutty Boy. This Lee Thompson line up, houses just half of the original album’s song writing team on stage. Chris Foreman was present only in video clips, in his song writing genius of this performed work, and in comments made in his honour, he’s not here in performance and presence. (While Steve A has sold his instrument, and remotely mentionable hong kong dave is now out with Seamus back in the band full time like year one.) The axeman’s presence is desired of course, Chris was and is central to these songs creation and fandom. He’s lead and created the band, and spoken so sincerly about them previously. 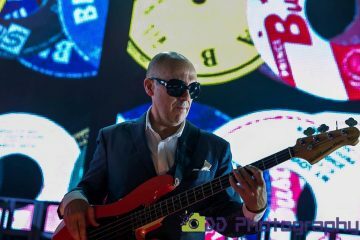 When asked after the gig by a fan, Lee said fondly “The door is open”, in fact Lee later, just before Boom Town, told us of a daydream he’d awoken from the night before, in which Chris had returned in time for the festival, so this isn’t a bitter Dammers vs Specials situation of a comeback closed, it’s a disbelief in the event thus far from one half or it’s originators, much busy elsewhere with life now, departed from his 90’s gang, but consulted and giving blessing for this goahead. He is much “The prodigal son” in the eyes of those wishing a future return for him. A few fans even refused to attend due to this absence. They all missed One Almighty Crack, that did justice to the songs that he wrote. My day begins in The Dublin Castle, a mad meet with Simon & Donna, Leah, and Garry Saunders. The first of which I’d first met at a Crunch! gig back in the day. Leah (at the golden age of 18) falls into the catergory of first time hearing these songs live, with Garry a fan that hasnt seen this kind of gig since the 90’s. There is much excitement a few beers, fist bumps and banter between us all. Swanny later joins us for a drink, and we are tasked with finding a raffle ticket book, as Swanny is organising the event and needs one. We excitedly raise a glass to the days celebratory feel, and Stuart Wright arrives. A little later, it’s a delight to see Graham Hewson and Fran, who’ve made the trip espeically. As we all stand togehter outside the Fiddlers Elbow venue now the sound of “Fighting Amongst Yoursleves” can be heard escaping from the soundcheck. It causes grins. TV’s Paul Putner arrives, and he dubs me an ever present Easter Island moai type figure present at all Madness related gigs. Sharon, Daren, Lynn, Paul, Dave Smithy, Tom Cat, Andy, Maria, Hazel, Stav, the ranks of fans faces swells ever larger, this is going to be a good gig, once they let us all in, we stand impatiently seeking beer. We enter a pub filled with records on the walls, to the sounds of ska and reggea tracks. Hand stamped with the logo of the album in question celebrated tonight. The Police tape cordening off the stage brings a smile, barrier huggers now have to hug tape. A screen plays old Crunch! band images, such as the appearance on Richard Littlejohn show, and inspirational clips from movies like Taxi driver. 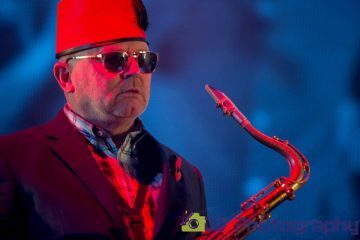 The sense of epic reunion is palpable in the crowd, as Spider and Tad take to the stage, shouts and cheers, Seamus, Louis follow, and sax Steve H takes place left of stage, followed by Kev Burdett on Guitar, with Swanny poised filming up one corner of the stage. The Sound of an airhorn cuts through the crowds excited chatter, as the band on stage commence the music, and through the crowd a zimmer framed figure stumbles. Baaaaaaaaaaarrrrrrrrrrrrrrrrrrrrrrrrrrrrrrrrrrrrrrrrrrrrrrrrrrrrrpppppppppppppppppppppppppppppppppp goes the air horn, out of the way please. A blue flashing light upon a policeman’s helment, a long over coat, armbands, white clown face paint, lipstick, eye patch, and shades, washing up gloves and a mean grimace. It’s ok I’m a nutter. Thommo reaches the stage and starts to sing, and with that The Magic Carpet rides once again. It’s something of a strip tease act when you start a gig with so much on. The policeman’s helmet is removed. Later this will happily be passed around fans post gig, for photo fun, as it’s inevitably stolen by renowned hat thief Leah. The surgical gloves, snapped off elastically, the coat, revealing the prisoner shirt of jail housed rock that’s barked forth by Mr. Thompson in classic Crunch! mode. The smeared white face makeup always washed away through the power and sweat of the beat. Spiders open handed drumming forcing through the tunes like a gattling gun, the pogoing accomplice of Tadman swinging his bass fret arm like Tommy cooper in the plank, ready to knock someone over and twin swirling organists hitting keyboard enough to rock them on their standings. From the very first song, (with only a brief loss of words on People at the beginning), the band are tight and powerful in creating the sound through out the entire set the level doesn’t drop from a great high. Even with the slight lower mood change of the track “Going Solo”, which looks like to be the first track written after the end of THE Madness according to new paperwork from Lee’s attic that appears on the Crunch! website, the mood is picked up again as this track jumps a groove into Whistle. Such a bouncy song, full of childhood nursery rhyme that it lands brilliantly as a juxtapose medley with the proceeding track, with no space between. I told Thommo now with Rolf inside, it might not be wise to do the Kangaroo reference anymore in Policeman. So listening to this advice, he covers it, instead with a Jimmy Saville impression!!!!!!!! It’s a great single none the less. Fantastic to hear it again. Pipedream. “that was ahead of it’s time.” Thommo said proudly of the lyrics and the state of the world today in relation to them. Fur Elise as always is a skanking highlight, spot lighting Louis. I take the opportunity to throw nutty shapes with Dave Smithy in a unison of much arm shaking. Classic music, a classic now 24 years this bands set too. For me, though, as I said at the beginning of my review, Saints and Sinners was the song of the set, and the one I had been waiting the most for. It vented bottled energy of a fandom denied a live gig for soo long and it rode the excitement that was in the room all night long. Started by a keyboard swirl from Seamus, Thommo introducing him as The Reverend. He sang the advertising jingle for Fairy Liquid over the intro solo “hands that do dishes…”, dedicated the track To Ghandi and Hitler, then launched into it with gusto. Thommo sings these Crunch! songs charactorially, like its hammer house of horror night. The “woo hoo” 70’s steam train ending, while Thommo whips his head back from the Mic, just priceless eccentricity, hard hitting band power and sheer entertainment. By all accounts. All kinds of fan’s enjoyed this. The ones who’ve been there since the 90’s saw a return to energetic form in fitting with their memory of great gigs, the ones who had only witnessed previously flatter recitals from the 100 club 2000’s decade now saw a full on punch of a gig that sold the songs better than they had ever heard before, and the new fresh fans were just wowed into the world of these tunes brand new and fresh, the eccentric sight and full on sound now a new favourite now to them. Whoever you were as a fan. With this set of songs. You Got It. Depsite being so phenomenal, and the real feeling of post gig depression on the Monday could be read across facebook statuses too, it was a gig that left you wanting more. I’d love to hear Tap Dance again. Complication’s was too complicated to learn in time! A green buss midnight rider might have been nice. The venue offered the band a residency off the back of the event, but the next gig might be somewhere else for variety. I can’t wait for our one time editor Looby Loo to return to see this band live again too. The band then headed to BOOM TOWN next on the Friday and did it all again, for a festival crowd. A hectic early start saw them opening The Ska events at the Boom Town China Town area. Passes and stress were all ironed out with a delayed wait a while lighting rig was double checked (worth checking twice incase Thommo climbs something!) But the opening Town Crier who was then on stage to announce the events was soon ushered off by the zimmer frame entrance of Thommo, Air horning him away. A Small dedicated crowd witnessed this entrance from the banked audience area, growing to the sizable hundreds drawn in by the sound towards middle of the set. There they witnessed Lee take a shower of bottled water before “Saving for a rainy day” or sax scaring a Foghorn Leghorn with his instrument blowing the chickens head some (a small soft toy that had been thrown up on stage, and was later returned to the crowd with a big throw.) The band sounded tight, Kev more freely blasting guitar to a fresher new festival crowd, and Steve Hamiliton sax battling with Thommo too at one point. Tadman’s boundless energy firing Spider ever onwards reveling in the better sound set up of the festivals outward outdoor speakers. “Pipedream” was dropped but they stole an extra 10 minutes to complete the set otherwise the same as the Fiddler gig had been. They were watched in the wings by an amused Rhoda Dakar, who was due on the stage later that day. When will these songs be heard again. Will “The Nutty Boy”, ride his magic carpet once more. Is the name changing next to “Going Solo” or something else? Will we get to see them with the prodigal axeman in the more distant future? Will the set include Tap Dance ever again? Will there be some more music released? With a gig so powerful a run through of just 16 songs as the Fiddlers set was, to a devoted crowd of followers old and new. A celebratory reprise was needed I felt. Along with others I shouted for Magic Carpet again. And we got a second helping of the iconic single, to better round off a great day. “Thommo it’s Chrissy Boy” plays the message clearly for all to hear in Thommo’s badly disguised own voice recording, barely an impression at all, and not fooling anyone. “I cant come out tonight I’m baby sitting. But if you play any of my songs. I will F***ing sue you.” Screams the fake message. And Thommo leaves the stage somewhat scolded and put in his place not like a white faced Saint but like a naughty little sinner. Amen & Halleluiah. Various posts from Facebook and Twitter that have caught our eye over the past week or so. “BIG THANKS has to go to Chris Foreman & Lee Thompson for both coming up with some truly priceless melodies on the Jennie and the Guitar Slingers album: It is just so nice to work with the professionals and I have to say I was secretly very proud of you both for being so brilliant, everyone really appreciates you coming down and adding your parts, Philip ‘Doyley’ Doyle is well chuffed as are the band and I cannot wait for the world to hear what you have done for us. So I’ve now had Specialized 3 – Mad Not Cancer for almost two weeks, and it’s been on pretty much constant playback ever since, think I’m up to about my 10th full run through now, with many tracks having been repeated over and above that, in compiling the individual track reviews (up to 40 now!!) that have appeared here over the past few weeks. Nice to hear those reviews are getting read and appreciated too – Billy Brown, who recorded Blue Skinned Beast for the album, related a nice story today about how he’d been out and about in a Specialized t-shirt when he was stopped by someone in the street who asked if he was a Madness fan – they got chatting, Billy explained his involvement in the album, and was told by the other person that they’d read the review of his track in MIS and were looking forward to hearing it!! So thanks mystery person, I hope you enjoy Billy’s track, and the others, as much as I have!! The album continues to surprise and please at every play – there is just so much there to be appreciated, with all the various genres and different takes on tracks that we all know and love. There are so many little touches that are missed at the first few listens too, such as Sarah Graham’s cover of Shadow Of Fear having a heartbeat sound running through its core, replicating the paranoia and fear that is the songs theme. Or the fact (and this one I’d totally missed until lead singer Wayne Kannessaa pointed it out to me) that the Ska Dogs cover of Uncle Sam uses the brass hooks from Sam & Dave’s “Hold On I’m Coming” throughout. Those aren’t the only ones either but I’m not going to spoil the joy of discovering them by detailing them all here. The album really does have something for everyone, and whilst I’m sure there will be those that don’t necessarily appreciate some of the genres and styles that appear on Specialized 3 – Mad Not Cancer – one of the wonders for me is the way different bands have interpreted the tracks, and shown that Madness’ music transcends any particular genre, given a little thought and imagination. It’s often been said that you can make a ska song out of pretty much any melody or style, well this album demonstrates that you can do it the other way round too. There are of course tracks on the album that stand out more than others, just as there are tracks that have been completely changed, whilst others have been lovingly and faithfully reproduced pretty much as they were originally recorded by Madness, and there’s nothing wrong with treading either path. I can honestly say there aren’t any tracks that I’m ready to add to the “skip” list just yet. Sure there are some tracks that will probably eventually get narrowed down as personal favourites, but I’m not going to name them here, firstly I wouldn’t want to influence those that haven’t heard the album too much, and secondly, and probably more importantly, it would be disrespectful to those I don’t name, because one thing is for sure, each and every track has been lovingly created with the intention of raising money for Specialized and Teenage Cancer Trust and that is the most important thing here. So you should start receiving your copies over the course of the next week, and I look forward to hearing what others think of them, as I said to someone the other day, I’m getting sick of the sound of my own reviews!! If you’ve not bought the album yet, there is still time to do so, but hurry, as the limited edition CD copies are selling fast. You can order at the following link (http://www.specializedproject.co.uk/#!shop/c1atu) and while you’re there do take some time to look round the rest of the site and find out more about the Specialized project and what it has achieved. Last week I closed by raising my hat to Paul Willo, the mastermind behind the project, who has almost single handedly raised over £50,000 for Specialized/Teenage Cancer Trust in a little over two years. Willo did a fantastic interview with a radio station in New Zealand this week too, talking all things Specialized and Mad Not Cancer, along with the station playing a number of tracks from the album, it’s well worth a listen and can be found here: http://www.musicaloccupation.com/podcast/go-feet-radio/go-feet-radio-305-specialized-madness/ (Mad Not Cancer tracks followed by Willo’s interview start around 25 minutes in). This week, however, the hat gets raised to each and every artist appearing on the album, as mentioned earlier the time and effort alone that each artist has put into creating their track is to be applauded, all of which has been done with one aim, and one aim only, making more money for the charity. So each and every artist appearing has my utmost respect for everything they’ve done. Enjoy the albums as you start to receive them!! 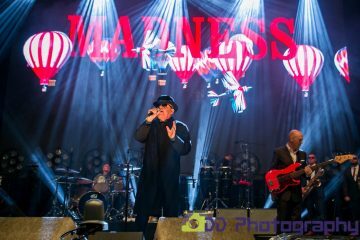 This past week had been a bit of a frustrating one for Madness fans, as many reported numerous problems when trying to download the new Sugar and Spice single and b-sides. Problems seemed to have begun when those who pre-ordered the single from the Madness section of the Recordstore web site received notifications stating that track 1 was ready for download, but track two wasn’t. A day later and the problem remained. After speaking to staff at Recordstore, Madness fan Paul Rodgers was informed that staff thought the issue affected all those who pre-ordered or were going to order the download from them, and that they hoped to resolve the problem in 1-2 days. “Pete Doherty, The Small Faces and Madness singer Suggs are among the musicians whose lyrics have been selected to appear on special edition mugs from Transport For London (TFL). 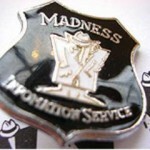 News in from the official Madness email list was that all 500 of the Madstock USB audio sticks had now sold out. If you hadn’t picked one up all was not lost as the recording of the concert was now being made available as an MP3 download instead. Continuing on a Madstock 5 related note, with the mass of YouTube video clips of the event now being hosted on the video streaming web site, we devoted an article to detailing a comprehensive list of some of the best videos taken on the day. In chart news Paul Rodgers reported that The Liberty of Norton Folgate had fallen from 7 to 9 in the Indie chart, and had dipped out of the top 75 album chart. With regards to the Sugar and Spice single, it held achieved the rare distinction of charting nowhere. Not in the main or indie singles charts. Paul Rodgers brought this issue of the MIS to a close with the news that EMI had licensed a number of lyrics from their catalogue of tracks to be used on t-shirts to be sold in branches of River Island. Baggy Trousers was amongst the collection of songs, so you could expect to see this in stores as part of the deal. With the MIS list server outages still continuing we were starting to get used to sending out the bulletins via our own PCs, in an effort to keep the Madness fanbase up-to-date with all things Madness. The list server playing up brought with it other problems, too. Those who wanted to change email address or (heaven forbid!) unsubscribe, were also unable to do so while the service had gone temporarily belly-up. Subscribers were assured that we were still looking into the problem but we had no idea how long it would go on for. On to the issue itself, and on the Monday after the last MIS had gone out the latest edition of “Comedy Connections” was shown. This documentary series charted the careers of actors, comedians, writers and producers in connection with one famous seminal TV show. The programme spoke about how the show had been classed as a variety show in order to get a bigger budget and this is how a band ended up as being a part of every show. 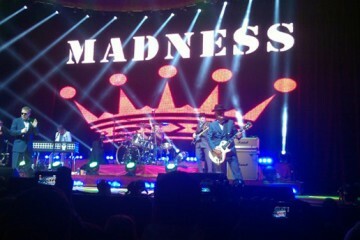 Clips of the bands were shown which included Madness doing House of Fun. “We were singing I think in the Kebab and Calculator, pub and then I uttered the immortal line…….. In this much packed show there wasn’t time to mention that Ben Elton had once attempted to write a show about Madness after their 2 appearances on The Young Ones. But it was nice that the band’s input into the series was noted in this small section of the programme. 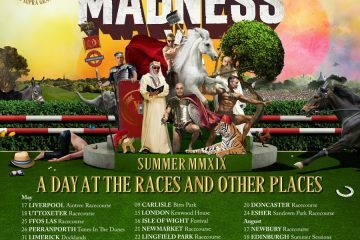 Moving on, and Bedders announced (via the official Madness web site) that the Dangermen tickets competition was entering its last few days. The competition itself had already ended, and the band were shuffling through the entries. Once a winner had been announced they’d be given two free tickets to the next Dangermen gig, plus something from Bedders’ kit bag. What the ‘something’ was we still don’t know! This week the band were after your help. All you had to do was send in a JPG of yourself, and at some point in the not too distant future it would be uploaded to the Madness Photo Album section of the official web site. The winner would appear on the news page of the news page of the site for one glorious week, and the rest would appear elsewhere on the site. Finally recovered from the Dangermen gig which took place at The DC on the 25th of July, MOT Drummer, Dan Fossard finally got around to knocking up a detailed review for publication in this week’s MIS. Dan’s lengthy write-up by revealing that he’d heard that future Dangermen gigs would be taking place in the future. However, he did point out that these were only rumours. After the recent hectic round of promotion that saw the band appear on pretty much every TV channel, music paper and music review, the lads were now enjoying a bit of a breather before things would pick up again for the second single and the forthcoming album, `Wonderful`. The second single had just been announced as being `Johnny The Horse`, and this was pencilled in with a second week of September release date. The album artwork was currently being worked on, and Bedders told us that it would be a nice package. After the excellent gatefold CD single release, who were we to disagree? Mark had obviously been keeping himself busy over the last couple of weeks and months as Stuart Wright (editor of the Madness fanzine, `Nut Inc`) informed us that Mark was responsible for the sleeve of a recently released `Terry Edwards` CD which Terry himself sent to Stuart for review. Stuart told us that the design was very impressive and hopefully we’d be able to see a picture of it in the next issue of the zine which was due for release towards the end of the month. 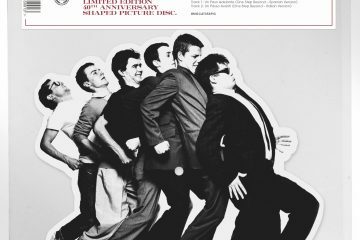 Elsewhere on the fanzine front, and Ska-Mad editor, Juliet Carter emailed in to tell us that issue 7 of the `zine would be released shortly. On to the articles in this week’s issue, and subscriber ‘Gaz’ pulled out all stops with an absolutely massive transcript of an interview Suggs and Woody gave on Top of The Pops Radio on the 1st of August. It’s still a great read 10 years later. 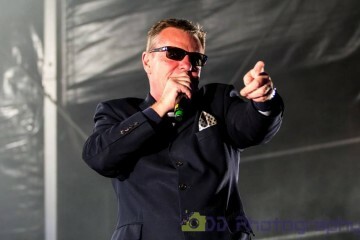 Moving on, and we gave a good plug to David Wassell, and his new ‘Bedazzled’ web site, which was totally dedicated to the one and only Suggs. Featuring a discography, videography, midi file section, and more, this was a site that clearly had received many hours of care an attention to get it up to its current state, and was clearly one to watch. Next, we had a transcript by Richard Huggins of an article found in the September edition of “Later”, the magazine for the “older man”. As the article was so big, Richard opted to transcribe it in chunks. In ‘chunk number one’ the band spoke about their school days. Finally, we finished off this week’s issue with a fantastic piece of writing from Vince Foley who commemorated 7 years since the first ever Madstock, and what the atmosphere was like at that first ever Madstock back in 1992. It’s still a wonderful read. I was asked to show the Madness Fruit Machine “in action”. Mine hadn’t been working for a few months after moving it from our upstairs bedroom to the garage. I managed to find the relevant replacement parts and voila, she is back up and running. The original video is 650mb and of high quality but after posting to Facebook it’s not so great, but watchable. I know lots of Madness fans have never seen one, let alone played it, so thought it was an opportunity to get a video together. Graham Yates returns with a mass of track reviews from the Specialized 3, Mad Not Cancer album. Maddy Carty is a singer/songwriter from London whose influences span several genres including reggae/ska. Here she delivers a more than accomplished cover of Madness fan favourite NW5, adding a slightly rockier touch along the way. Where the original starts with Mike Barson’s pounding keys, Maddy uses her excellent voice to open it with the “I would give you everything, just to see the smile you bring” refrain, accompanied by just a piano. The song proper then kicks into life, the bass drum leading the way, with the keyboards for company. Maddy demonstrates her considerable vocal range throughout, and it’s her voice that shines here, holding the song from start to finish. I’m no expert, but I’d bookmark Maddy’s name and remember where you heard it first. Specialized stalwarts Big Fat Panda, take this tale of a man’s journey from family life to an untimely demise on the streets of London, give it a ska makeover with added horns and bounce, and cleverly turn it into the tale of a journey from Edinburgh (home of the band), to the Specialized “Big One” weekender to be held in November in Dorset, where they will be performing. The vocal is understated, yet effective, the brass keeps the bounce there right till the end, and as a whole the song works pretty well. The Skoisters from Bournemouth describe themselves as a Ska/Oi band, and that’s exactly what they deliver here with their cover of the “7” album track. Drum and guitars are to the fore and drive the song from start to finish, with the exception of a “chickitup” ska break mid-song that works really well. Playing over all of this is lead singer Adrian Noon’s fairly laid back vocal that actually provides the perfect counterpoint for the drum/guitars. Long-time Madness fan, Phil Jupitus, adopts his Porky The Poet moniker and teams up with sometime Lee Thompson stand in, writer of the One Step Beyond: 33 1/3 book, and multi-talented instrumentalist Terry Edwards for this cover of the title track of Madness’ fifth album. Now this one falls into the category of “radically changed from the original” as it is essentially Phil reading the lyric in an almost Jackanory style, set against Terry picking out a random tune on an electric guitar. Yes it’s completely eccentric but it works perfectly in my opinion and actually proves that Madness’ songwriting has an element of the poetic to it. The honour of opening the album goes to Specialized supporter extraordinaire and ska scene stalwart King Hammond, and deservedly so. He’s taken the “almost single” from One Step Beyond, given it a nice ska bounce courtesy of the brass, a piano melody, added just the right amount of bass – all of these underpin the jaunty vocal, resulting in the production of a more than worthy opener. The Erin Bardwell Collective are based in Swindon and currently a five or six piece with guests dropping in and out on a regular basis. This is their second outing for Specialized following their cover of “Which Side Of The Bed” for Specialized 2 – Beat Cancer. Here they deliver a rocksteady cover of Wings Of A Dove that is much slower and measured than the original – vocals are shared between Sandra Bell and Erin Bardwell herself, and the interplay between them works well. There’s some nice keys and percussion throughout, taking the song to the final chorus which sees both vocal parts neatly interwoven. Another one that’s distinctively different from the original but hasn’t suffered any as part of the transformation. The original, from the Wonderful album, is quite a bright and breezy number full of brass and bounce and was covered previously by Right Said Fred for the Der Wixxer series of films, although that cover was an almost carbon copy of the original. This version by Martin Black is totally different, and is another track from Specialized 3 – Mad Not Cancer that features just an acoustic guitar and a vocal. What we end up with is a darker version of the song, full of deep and driving vocal accompanied by some fine guitar playing which amount to a song full of intensity and intrigue, and no worse off for it. System Of Hate hail from Barnsley, South Yorkshire, and are described as a “Punk rock tsunami of noise with extremely dark lyrics” and that pretty much describes the way they deliver their cover of the My Girl B-side: with driving drums and guitars throughout, and lead singer Suty’s angry vocal complimenting the style perfectly – add to this some rasping sax from band friend Andy Blower and you have another totally different and rocking cover!! The original, the B-side to Our House, was a brass and keyboards instrumental with a few dubby overtones – this version, that relies on synths and keyboards with various sounds coming into play along with underlaid vocal parts, could almost be described as verging on “Trance” as it’s genre (iTunes lists it as Electronica/Dance), but does the original no injustice and makes for an interesting exploration into what can be done with a Madness tune with a little thought and imagination. Definitely a song for listening to with the lights turned down low and a mind ready to wander along with it. Now I must confess to having a longstanding connection with Indeed, particularly relating to their cover of this Mad Not Mad album track, which all started some years ago when Judge Fredd of the band asked the question on a Madness forum as to how Suggs created the “megaphone” effect on one of the verses of the song when performing it live (which from hazy memory of a gig on the tour supporting the album, I thought was done by Suggs stuffing his mouth with cotton wool) – anyway, over time Fredd has variously asked me to reproduce the effect in the same way, to much amusement across La Manche!! I was also asked to do so for this cover, and mercifully I declined, as it wouldn’t be the track it is today I can assure you. Indeed, are probably best known to fans for their cover of “The Sun And The Rain” on the French MIS 30th Anniversary Tribute album where it was one of the stand out tracks. Here they deliver Burning The Boats in a similar, although possibly more melancholic, style with a simple piano led melody that underlies singer Emelie’s beautiful vocal. And that tricky “megaphone” effect? The band have gone for an echo-y overdub of Emelie’s voice that works much better than me and a wad of cotton wool!! The ‘Meanies deliver a fairly straight run through of what I happen to know is one of bass player Gordy Davidson’s favourite Madness songs. They’ve replaced the piano with an organ, but other than that stay faithful to the original, showing it no disrespect whatsoever – there are some nice brass touches added in throughout, and the guitar solo gets a new lease of life in someone else’s hands. A bit like The Simmertones cover of Drip Fed Fred that was reviewed last week, what shines through here is the sense of fun the band had recording the song – and if you can’t have fun then you’re not left with much!! I first became aware of Ska’lett earlier this year, through Facebook posts raving about her CD release of various covers in a mainly ska style, ranging from Hazel O’Connor to The Clash. Here she takes the B-side to Embarassment and adds a vocal that will probably be likened to Amy Winehouse or perhaps Imelda May, but that would be doing Ska’lett an injustice as her vocal is both unique and distinctive in style. The ska/reggae melody meanders along at a slower pace than the original, and that works perfectly with Ska’lett’s vocal performance – there’s a neat sax break mid-song and the spoken word part towards the end draws out Ska’lett’s deep and rich Welsh accent to great effect. One to watch out for. Fans of Specialized, and indeed the ska scene in general, should be no strangers to Swagga, who have now appeared on all of the Specialized albums, bringing to each their own unique brand of ska/hip-hop. This re-working of Don’t Quote Me On That demonstrates the band’s core style perfectly – the original melody gets a funk makeover reminiscent of the style of Ian Dury & The Blockheads on something like Reasons To Be Cheerful, all of which is overlaid with front man Ray Gudge’s frantic rhymed vocal, which re-imagines the original lyrics and brings them right into the 21st Century to great effect. Like your punk full on, chest out, fast drums, and just as fast guitar? Then the No Matarás cover of the classic showtime number is right up the (middle of) your street!! The band are originally from Argentina but now live and perform in and around Berlin, and they go for it from start to finish in fine style. The song kicks off with a roll of the drums that sets the pace for the rest of the song, lead and bass guitar then pick up the pace with the vocal overlaid at just as a frantic pace. The fact that the band manages the tricky “I remember way back then when, everything was true and when we would have such a very good time etc…” verse almost word perfectly at that speed, and not in their native language, is to be applauded. Definitely one to leave you breathless after listening to it!! The Cabstars from Coventry describe themselves as having “a mission to create a new Ska & Reggae sound for the 21st century. With a fun attitude, danceable rhythms and lyrics which reflect modern life” – and from their cover of the One Step Beyond album track, I can relate to that totally, even though the track was originally made in the 20th century, it’s tale sits just as well in this one! Here they perform a slowed down, almost reggaefied version, and it works really well. Both piano and sax get some key solos, and Ben Hugh’s lead vocal, shadowed almost throughout by Catherine Stephen’s backing vocals, compliments the melody and pace of the song nicely. Addictive Philosophy hark from the Derby area and have wide and varied influences that range across various genres from rocksteady through to full on thrash metal. Here they deliver a cover of the Absolutely album track that kicks off with a neat trumpet solo replacing the more familiar building drum beat intro. The bass then gets turned up a notch or two from the original, accompanying singer Gez Addictive’s vocal. There are minor tweaks throughout including some nice interplay between trumpet and saxophone which brings the track to a close. Another song that stays fairly faithful to the original, doing the band no injustice in the process. The Sound Syndicate from Spain have performed a neat flip on the seventh Madness single: whereas the original is a largely piano driven track, with some sax breaks dropped in and out, this cover is mainly led by the brass section with a piano solo or two dropped in. It gets more of an old school ska feel as a result, conjuring up images of beach bars and rum based cocktails – or perhaps that’s just wishful thinking on my part, given the lack of holiday so far this year and the rain falling outside my window right now!! London four piece Katalina Kicks return for a second year after their rocking cover of The Beat’s “The Limits We Set” for Specialized 2 – Beat Cancer. This year they go down a slightly mellower route with their cover of Mad Not Mad single “Yesterday’s Men”. 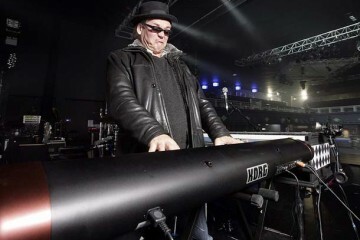 The keyboards of the original are replaced with driving guitar and strong percussion, which work well with lead singer Ian George’s vocal neatly counterbalanced by bassist Natalie Silverstone’s dulcet backing vocals. Will they be here in the long run? I think so!! The Klank, from the Chicago area of the US of A, are a 5 piece who cover music from the 60’s right up to date. Here they deliver a cover of Baggy Trousers that has elements from across those eras, including a Kinks style riff intro that then kicks into the song proper. The overall song here reminds me a little of something like Blink 182 but has various other influences too, including a classic 1970s style heavy metal guitar solo towards the end. That’s just about it for this week’s issue of the MIS. We learned this week that “Cathal Smyth” would appear to be the name that Carl will choose to go under for his solo album. He has removed all Cathal Mo Chroi accounts and is re-launching the pages under his own real birth name, as previously used as credit on The Madness. All members that participate will automatically be entered into a random draw for the 10 x Limited Edition SUGGS ‘That Close’ bookmarks produced by book publisher Quercus. Members can enter on a daily basis to increase your chances of winning by completing the tasks set out in Step 1 & Step 2. All winners profiles will be verified to ensure all tasks have been fulfilled having liked & shared the image ‘MAD CHAT Wants You’. Good Luck & Get Sharing ! !